The collection features original photographs of lilies grown by the St. Louis Water Gardening Society in the Jewel Box lily pools in Forest Park. There are 12 high-quality, matte-finished cards, blank inside, 6-1/2″ x 3-3/4″, with envelopes. Proceeds help support the Jewel Box project. The pins mark the 10th anniversary of Pond-O-Rama and the 20th Anniversary of the St. Louis Water Gardening Society. Both anniversaries occurred in 2010. 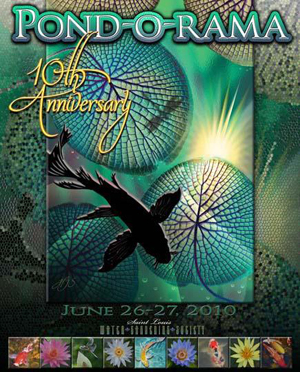 The 10th Anniversary Pond-O-Rama Poster was designed by member Howard Schroeder and features his original artwork. The poster is 14″ x 20″ and is printed on 100# glossy paper. If you missed the 10th annual Pond-O-Rama, here is your chance to catch up. 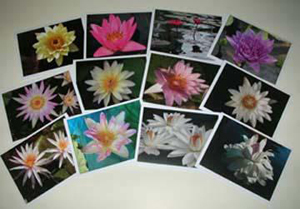 Full color photographs of all 54 of the featured ponds are gathered together in this DVD collection.